VCarve is a powerful software program for 2.5D milling. In machining, 2.5D refers to an object that is a projection of a 2D plane into the third dimension. Although the object itself is three-dimensional, it cannot have 3D contours, which are smooth transitions between different heights of the material. An example of a contour would be a smooth, upside-down bowl shape. A 2.5D shape also can’t have undercuts, which are areas below the material surface that would need to be machined from underneath. VCarve is ideal for projects such as flat cut-out shapes; engravings in wood, metal, and wax; signs and stencils; and press-fit projects like dovetail boxes and inlay. Where do I get VCarve? You can download a free trial and see all the features VCarve has to offer at the official Vectric site. 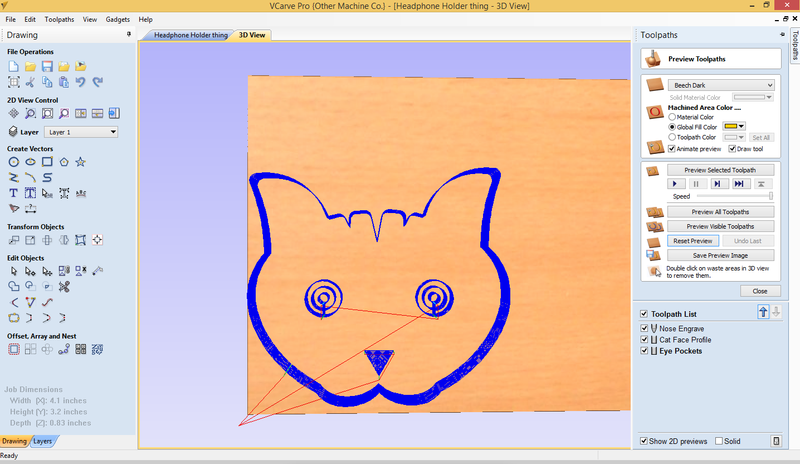 VCarve is presently only available for Windows, but the G-code files you create can be imported into our software. How do I create a file in VCarve? Before you start a project, you’ll want to make sure you have a basic working knowledge of CAD and CAM. With that said, VCarve does make it reasonably accessible, even for the inexperienced. 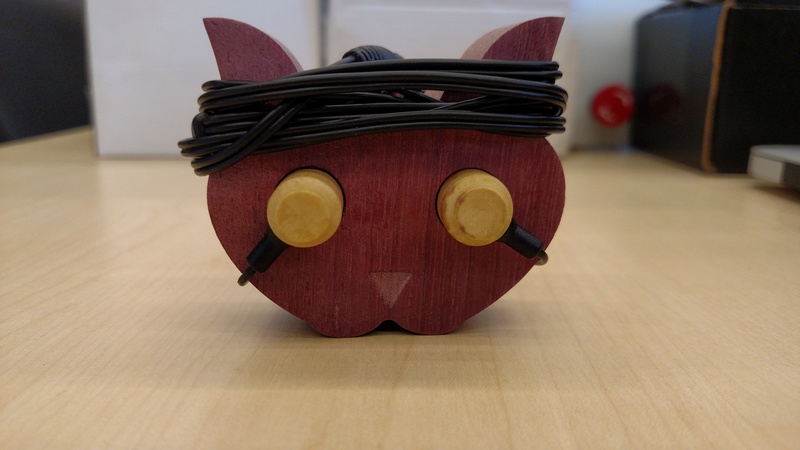 For tips on getting started, VCarve has video tutorials available online. For a more general explanation of CAD and CAM, our CAD and CAM support guide can help, as well as our Basic Project Workflow guide. VCarve has a combination of CAD and CAM capability. 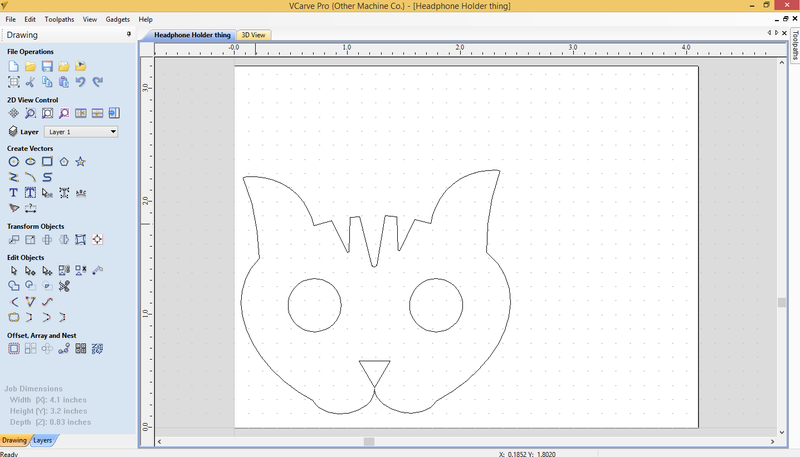 This means you can design in the software entirely, or you can import a bitmap image, trace it, save as a vector, and use the VCarve CAM functions to create the toolpaths. 1. Set the dimensions of your material and start designing your image. 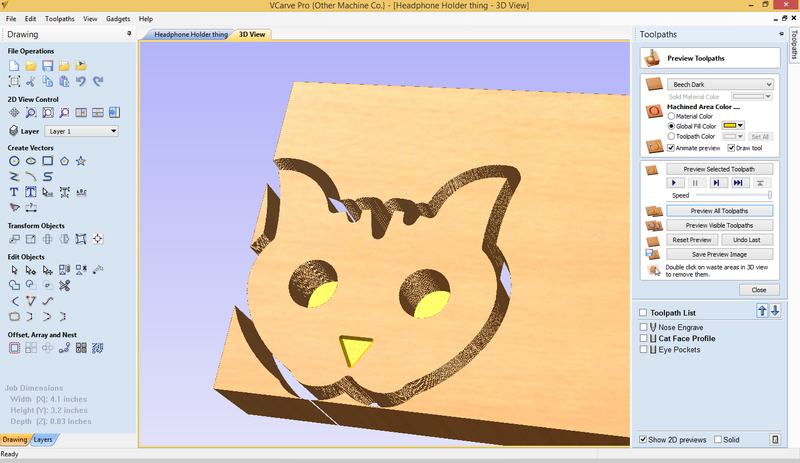 VCarve comes with a variety of design tools that are similar to design tools you might find in a graphics program. 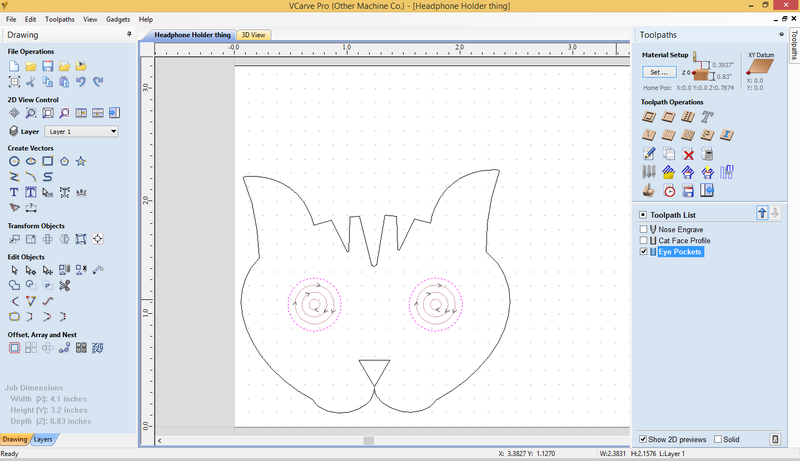 The most common tools are for making circles, lines, and arcs, which can then be transformed with VCarve’s various selection tools. There are also options for precise alignment with the material, cutting and pasting, and measuring elements of your design to line up with the real dimensions of the material you’re cutting, rotating, and scaling. Special features of the VCarve design mode include nifty things like nesting small design elements within larger ones to conserve material, arraying identical copies of your design across the material, and creating elements that optimize the way the tool interacts with the material. 2. 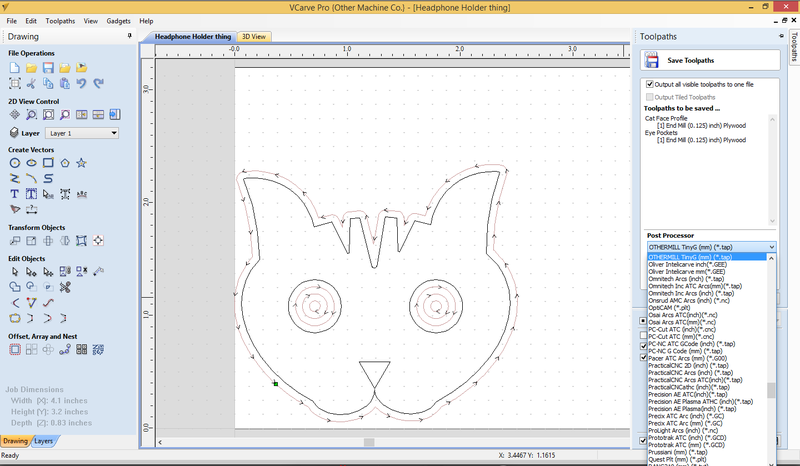 Turn your CAD design into toolpaths. When the CAD portion of your project is done, in the CAM portion of VCarve, turn your artwork into toolpaths that can be cut with the tools of your choice. 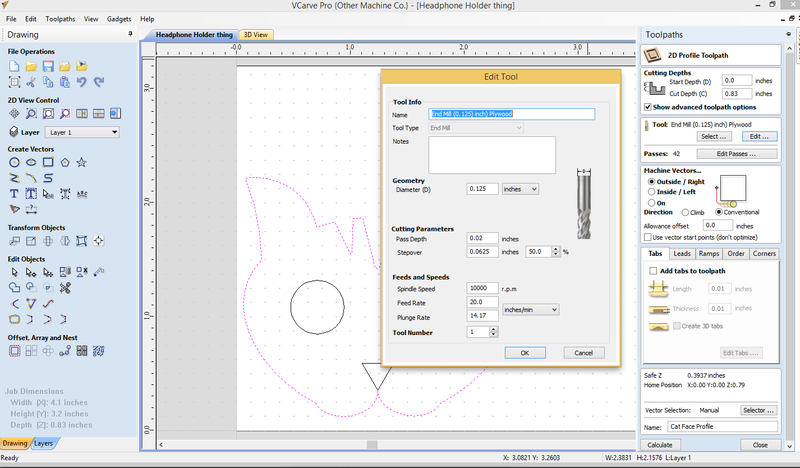 Start by clicking on the Toolpaths tab in the upper right-hand corner of the VCarve window. The Toolpaths menu will expand. Highlight the vectors you’d like to cut, and use the toolpath planning panel to select the type of cut and the tool you’d like to cut with. For this project, we selected the 2D profile toolpath for the outline, a set of pockets for the eyes, and engraving with cross-hatching for the nose. For the 2D profile pictured above, we selected the tool and set the RPM and feed rate we wanted for this material (“speeds and feeds” in machining shorthand). Speeds and feeds are how the tool interacts with the material to achieve the effect you want for the job you’re doing. Speed and feeds can vary based on the tool, project, material, and the way you want to cut. If you’re new to machining, it might be a little overwhelming to understand how feeds and speeds work or know where to start. There are many resources on the internet on how to properly calculate speeds and feeds. We also offer recommended speeds and feeds for many materials in the Materials guides on our Support page. VCarve has the capability to save tool profiles, so you can label and use the tooling you need without having to set up the values over and over. You can create toolpaths that use different kinds of cutting operations but that use the same tool and then combine them later into one file. Toolpaths that use different kinds of tools to create a specific effect should be exported as individual files, one per tool. 4. 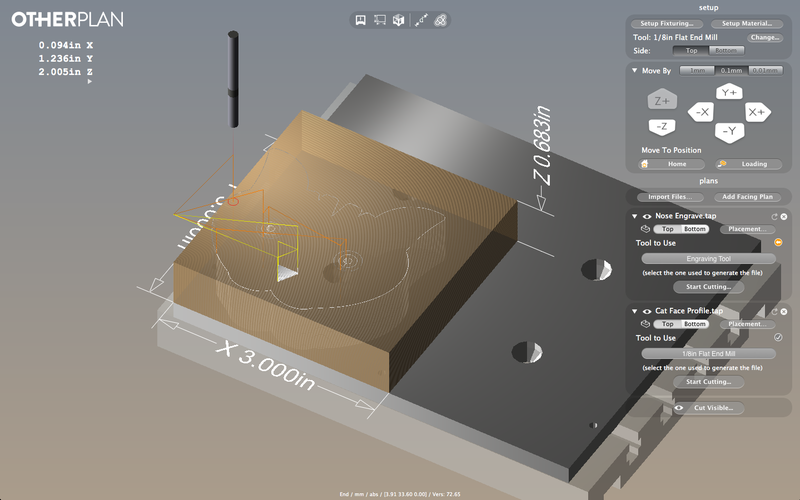 Save and export the toolpaths. Once the preview is acceptable, save the toolpaths and export them using our custom Othermill post-processor for VCarve. Unzip the file, and place it in the folder where other post-processors for VCarve are saved. Restart the program, and your post should be available in the post-processor menu. 5. Import into the software and cut. Import your newly created G-code directly into Bantam Tools Desktop Milling Machine Software and get ready to cut! All the files can be imported into the software together. 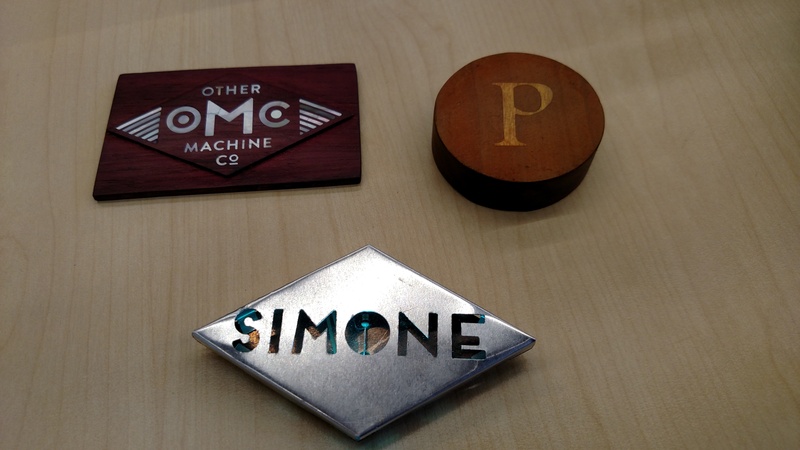 Once you’ve set up and cut your file, you have a nice finished piece you made yourself, from the materials you love.